Fancy seeing your picture replace the grey space above? If you’re an exhibiting member and haven't yet submitted your work to the RGA Online Art Gallery, you can submit at anytime for inclusion. Or if you do have a Gallery page why not refresh it with some new images! To submit work please follow the Gallery Submissions guidelines. Next month's Picture of the Month will be picked from the new submission by me (including any added since the new year) to kick start a new Picture of the Month relay! Many thanks and I look forward to seeing your new work, Martina. 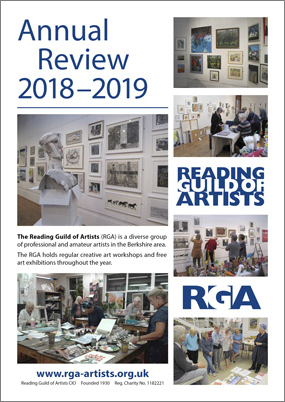 The Reading Guild of Artists (RGA), founded in 1930, is a diverse group of professional and amateur artists in the Berkshire area. The RGA holds regular creative art workshops and free art exhibitions throughout the year. Can you recognise any familiar landmarks in the distance? Take a closer look at our current Museum Highlight. Have a look what our members are up to, check our sister website RGArt Events, the place to find art events, news and studio visits by RGA members!